Whether we like it or not, we are all products of the time in which we grew up. Some of us cling to those times with the warmest fondness. Some of us don't. I don't. The eighties were about as opposite to my own heart-of-hearts as a decade can get. In a candy-colored, shiny, ostentatious, flamboyant, synthetic, pop-driven time, I was a kid who read Sherlock Holmes stories, listened to orchestral music and progressive rock and who longed for the warm colors of fall and the pure, deep, pensive silence of winter. In terms of ambiance, Easter: No. Thanksgiving: Yes. The pop culture of the eighties was cold and insincere to me. The music seemed empty and over-produced and even the standard of beauty for women seemed cold and harsh. Every model was six feet tall and rail-thin with angry slashes of blush and eye-shadow like electric storm clouds. Yet, in some ways, it may have been the best thing to happen to me, that decade. When the eighties hit and synth-pop took hold, I was twelve. It was like every song on the radio was tongue-in-cheek -- at least to me. So I crawled into music by people who sounded like they meant what they were saying. That music existed then, but it didn't (and doesn't today) represent the pop face of the eighties. 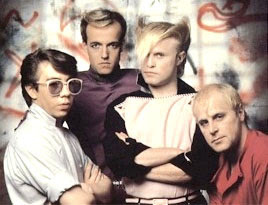 The one-hit-wonder band "A Flock of Seagulls" did. Take a gander. I can see how decadence and glitz can be a blast to some, but I needed something more real. More tied to the properties of human and earthly nature. I found it, but not in the pop culture of my teenage years. To this day, I flip past a VH1 eighties program with a shudder. And I have some great memories of my teenage years, but not associated with the pop culture of the time. Maybe it is a form of transcendence -- maybe it is just the way it works out for a kid who longed for honesty the way Billy Joel seems to have. As I said, maybe the eighties were the best thing to happen to me. In a way, what seemed to me to be the insincere nature of the time in which I grew up helped me to identify who I am more clearly by holding my autumn-leafed soul up against the sequined curtains hanging all around me. Otherwise, I might have just blended in with what was going on. WHADDAYOU THINK? I'd love to know how the popular culture of your youth affected you, for better or worse. Or how is it affecting you as you live through it? I'd especially be interested in hearing from my readers outside the US who can share their experiences. HAT TIP: Jason Rosenberg for the art and inspiration.